On Thursday, Prince Charles met with Archbishop Ieronymos, whilst the Duchess visited the Monastery in Kaisariani and also spoke to school children there. Later that day Prince Charles visited Piraeus for a tour of HMS Echo and HMC Valiant, which cooperate with the Hellenic Coast Guard and Frontex in search and rescue missions in the Mediterranean Sea. Together with H.E. 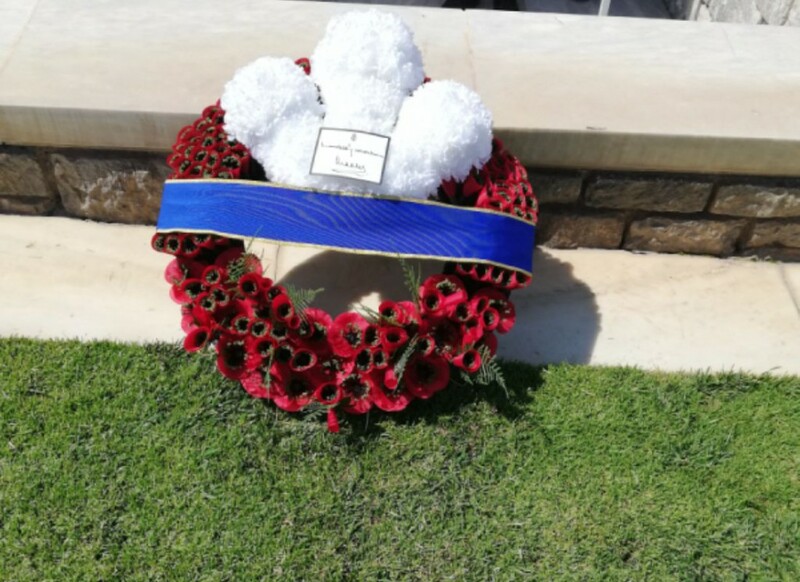 The British Ambassador to Greece, they were then escorted along the coast to the Commonwealth War Cemetery at Alimos, where at the request of the British Embassy, Deacon Christine Saccali was waiting to greet the Royal couple and to preside over a short ceremony of remembrance. Security was tight and the road was closed during the ceremony, every word of which had been previously submitted to, and agreed by the British Embassy and Clarence House. Everyone stood to attention whilst the Last Post was sounded followed by a 2-minute silence. Prayers were said for H.M. 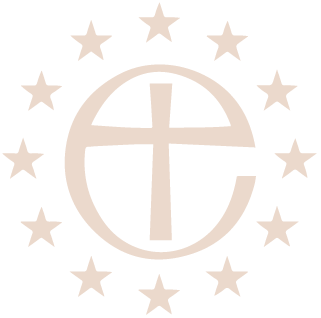 The Queen, who is the Head of the Church of England, The Commonwealth, which has just appointed Prince Charles as the successor to Her Majesty, for the citizens of both Greece and the UK and for all the casualties of War, both known and unknown, in this broken World. At the end of the formal service the Royal couple met other foreign Ambassadors who had travelled to the Cemetery for the ceremony. They then went on to greet a handful of War Veterans who had been seated under a canopy to keep them from the Sun. Prince Charles was very interested in talking to them and recognised many of the medals that they were wearing including one veteran who wore a Military Cross. He also noticed that one of them was wearing a tie from the Parachute Regiment. 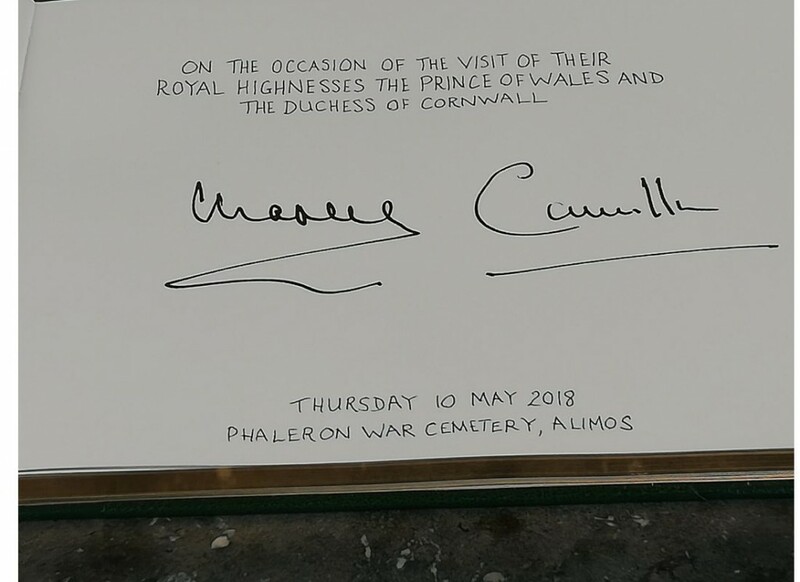 Then, escorted by members of the Commonwealth War Graves Commission who keep the cemetery in such beautiful condition, they took a short tour around the graves stopping to read the inscriptions on one or two. Finally before departing, they signed the visitors book and with a wave to the onlookers, they left. Later that evening, The Anglican Church was again honoured to be invited to a Reception at the British Embassy to meet Prince Charles and the Duchess. 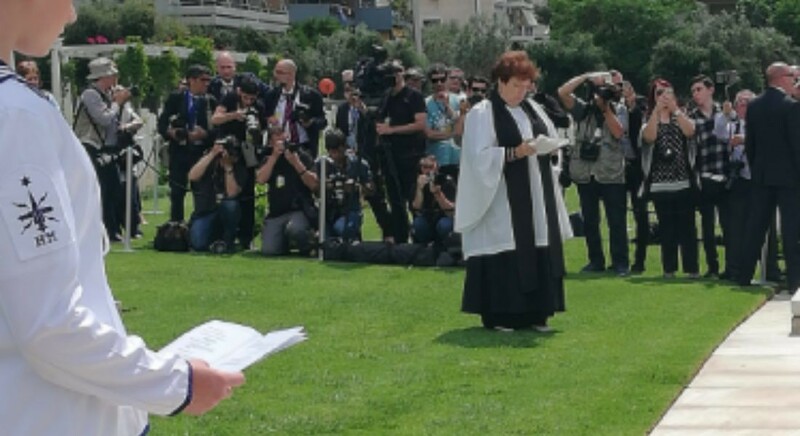 Senior members of the Church were introduced by our Deacon in addition to representatives from Apostoli, the charitable wing of the Greek Orthodox Church. 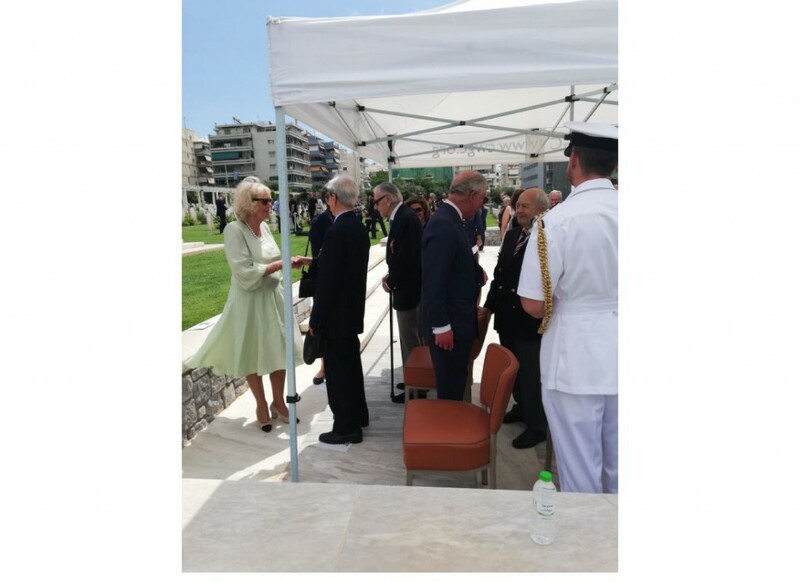 The Prince was especially interested to talk to them and about their work alongside us in our charitable outreach to help impoverished Greeks and refugees. On the Friday the royal couple flew to Crete for the day and then flew back to the UK. We were very honoured to have been part of what has been described as a very successful visit to Greece.